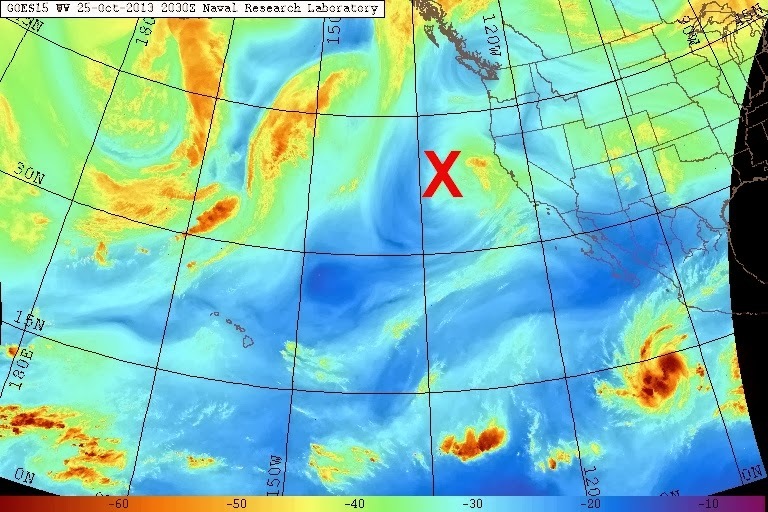 The red "X" marks today's location of the low pressure that will be affecting Utah next week. Obviously, there appears to be a significant amount of water vapor associated with this system. (the darker the yellow/orange--the more the water. ESPECIALLY ACROSS NORTHERN AND WESTERN UTAH. OR EARLY THURSDAY. COOL TEMPERATURES WILL PERSIST THROUGH THURSDAY. 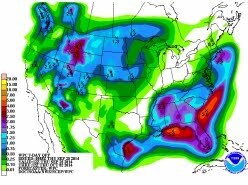 The above forecast virtually assures that we will be taking the Nephi-Salina-Kanab route south. Although the highways themselves "should" be in good shape on the Price-Moab-Kayenta route, the back country Slow Roads we planned to drive will be a sloppy mess. Better safe than sorry, eh? The small map shows the basic Fast Lane route south. Here's how it works:  Drive I-15 South to Nephi. From Nephi proceed south to Salina. Take I-70 West to us Hwy 89 exit. 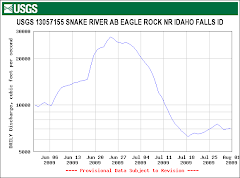 Proceed through Big Rock Candy Mountain along the Sevier River to Panguitch, Utah. From Panguitch proceed to Kanab and thence to Jacob Lake, Arizona. From Jacob Lake go to Vermilion Cliffs. Then cross Colorado River near Lees Ferry and proceed to Flagstaff. Get on I-17 and go home to Rimrock. Driving distance is 800 miles. Actual driving time is "usually" 16 hours. We generally camp in the Yuba State Park "Painted Rock" campground on the east side of Yuba reservoir. Then we generally stay at Susan K's place on Badger Creek Road at Vermilion Cliffs. Then we generally drive home from there. Hopefully, this year we will stay a little longer at Susan's Place. In closing this blog post, we'd like to leave you with both a glimpse of today's jetstream as well as the Northern Hemisphere view of the East and West Pacific Ocean. Here's today's jetstream. The part of it in the Pacific Ocean sure looks like "The Big Bird" with its wings spread. That participle sticking up sure looks like a head! In any event,that's a major dip in the jetstream. It looks like that dip in the jet is carrying a lot of water vapor with it as well. We're guessing those potential storms will hit the Idaho area in 7-10 days. If they hit square on, it could be a heck of a winter storm! 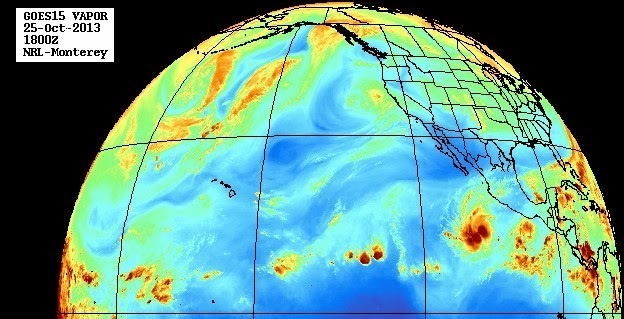 Here's the West Pacific water vapor view. 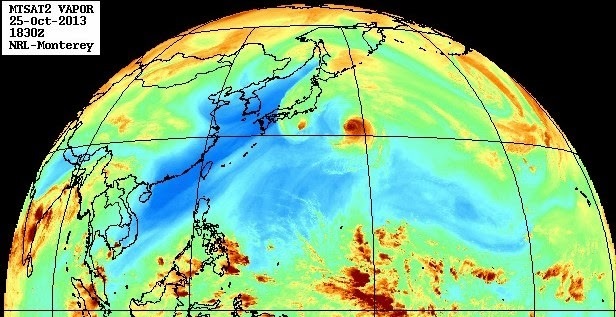 Looks like there's plenty of upstream water vapor riding over the top of Siberia. Perhaps a winter weather patterns is coming soon to the Northland, eh?